Understanding the dominance of corporations within the contemporary economy. The Corporation: A Critical, Multi-Disciplinary Handbook is the first of its kind, examining how corporations have become a dominant form of economic life. The handbook was co-edited by Andre Spicer, Professor of Organisational Behaviour at Cass Business School, and Dr Grietje Baars, Senior Lecturer at the City Law School. The book examines corporations and how they have become a dominant form of economic life. While corporations have been with us since the early modern era, their influence and importance have grown exponentially. Today, corporations are among the largest economic entities in the world. Their annual turnover is greater than the gross domestic product of all but the largest nation-states. 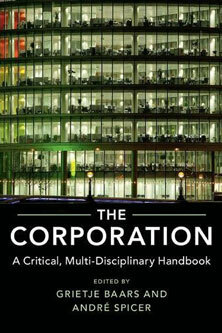 The Corporation: A Critical, Multi-Disciplinary Handbook is available from Cambridge University Press.